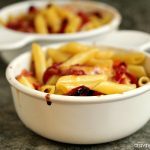 A simple macaroni and cheese recipe made with Beemster Cheese, Chorizo and Sun Dried Tomatoes! You're going to love this one! Cook your penne noodles in a large pot of salted boiling water until al dente. (my rule of thumb is usually minus one minute from the package directions in most cases) Drain the noodles. Set aside. In a saucepan over medium-low heat, combine the cheese, milk, creme fraiche and butter. Cook until the cheese is mostly melted and looks like a creamy sauce. To keep the cheese sauce from breaking you can remove the sauce from the heat a little bit before it's entirely melted. Season it with pepper to taste. Butter a shallow casserole dish. Toss the pasta with the ham (chorizo in my case) and sun-dried tomatoes. Pour the sauce over top of the pasta. Stir till combined. Pop in the oven for about 15 to 20 minutes, or until the top is golden brown. Remove and serve with a big old I Love Steph and Garrett's Mac n Cheese smile! What's really cool about mac n cheese is the unlimited possibilities. It's amazingly diverse. It also reheats beautifully if you pop it back in the oven. We made extra, then the next day we topped them with extra cheeses we had in the house and had them for lunch. Divine!